I also have a page on the site now for #5, depicting the final issue of the arc. I have a new interview online today with Graphic Novel Reporter about the series and some upcoming work; for fans of my comics research, there are also some new posts about comics past and present over at The Comics Chronicles. Finally, I would be remiss if I didn't recommend the Book of Sith by Daniel Wallace — I've read it and it's a really fun book in a cool package. Check it out! Zayne Carrick has pretended to be a Mandalorian many times — but now he's been captured by the Mandalorians and pressed into service. Drafted by two different armies in the same month? For Zayne, that's part for the course! And you can check it out in Star Wars: Knights of the Old Republic - War #2, now on sale at your local comic book purveyor's emporium! 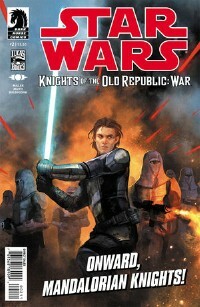 Also, Roqoo Depot has the exclusive first look at the cover of May's Knights of the Old Republic - War #5, the big finish to the arc. There'll be more up here about it in a few days — and I'll have notes online about our big second issue.